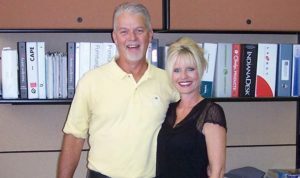 Curtis and Jennifer Scribner, owners of Rockford Office Supply House, offer products and services that big-box stores just can’t provide. Rockford Office Supply offers a full range of high quality office supplies and design services. We’re located on Main Street in downtown Rockford, in the same historic building where we’ve always been since opening in 1909. Walk in to our store and you won’t feel like you’re lost in a big box store! Instead you’ll be greeted by one of us – the owners – Curtis and Jennifer Scribner. And when you call, we’ll answer the phone – not some answering system. That level of personal contact is what sets us apart. Rockford Office Supply provides excellent customer service with a personal touch. Jennifer covers the sales floor and places orders. Curtis does office design, consultation and installation. He also makes deliveries. We’re proud to offer the finest brands of office furniture and supplies. We also provide entire office design services and custom installations. We have more than 5,000 items in stock and we can quickly access just about anything else you may need. Our catalogue has more than 65,000 items and our prices are competitive. Whether your need is large or small, Rockford Office Supply is dedicated to helping you. We’re a one-stop shop for current products, technology and expertise, with the best in contemporary office supplies and design services. And we’re an old-fashioned store when it comes to personal service and going that extra mile. Please call or come to our store at 119 S. Main Street in downtown Rockford. We’ll be glad to see you! Call or fax your order today for next day delivery !